When new signs appeared on city centre roads, Spokes member Beatrice Shire commented, "For years we have complained that there are more cyclist dismount signs than anything else on cycle routes, followed by 'end of route' signs with nowhere to go from there!" "I think we should find a way to make CCC members and officers use (or at least try to ride) the so-called cycle network they have created so that they can appreciate the discontinuities! I've already commented on this but having looked further I found the following interesting and amusing links. http://www.cycling-embassy.org.uk/dictionary/cyclists-dismount and... http://radwagon.blogspot.co.uk/2013/06/cyclists-dismount-sign.html Further to all the research, hot air, opinions and confusing and conflicting signs about the town that only reinforces the view that the local authority is daft. In my opinion the intention is that "Cycling is not recommended when motor vehicles are not allowed!" That's it, now lets stop wasting our time discussing the details, and get out and ride! 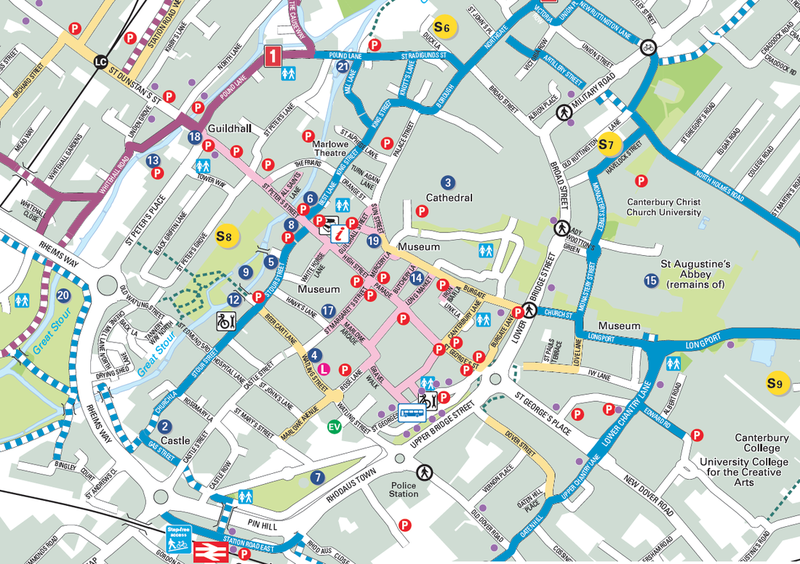 Where CAN you cycle in Canterbury centre? 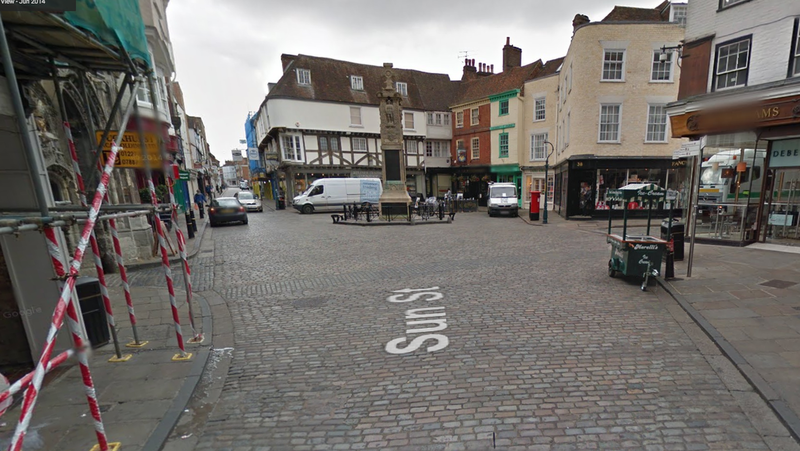 I am writing with regard to the new 'Cyclist Dismount' Signs that have been erected in the Centre of Canterbury. Please see an attached image of the one at Burgate. The new signs are at the following locations. ~ The entrance to the pedestrian zone in Burgate. Previously at these locations were blue cycle signs at the bottom to indicate that cycling was allowed. 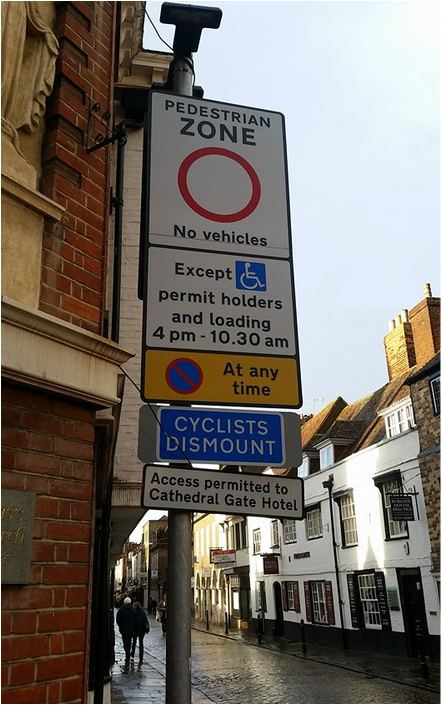 The new signs have a red circle 'no vehicles' sign at the top and a blue 'cyclists dismount' sign at the bottom, my understanding is that as there are no specific exemptions for cyclists then this sign indicates that cycling is not allowed at any time of the day. There are varying exceptions for blue badge holders, permit holders, delivery vehicles between 4pm and 10:30am, and access to at least one hotel. (Click for larger view; outside Cathedral Gate, Burgate) Cyclists would be banned from here, but what about the other traffic? I am one of many people who commute daily into Canterbury. I work right in the centre. Cycling around the ringroad is simply not an option that any many people would want to take, it's further, dangerous, heavily congested and polluted. The cycle routes that go around the town are patchy and a big detour. Having to dismount would add considerable time to peoples journeys and it seems bizarre when there are exceptions for motor vehicles which pose a far greater risk to people's safety. I must add that I have seen quite a few delivery vehicles outside the allotted time and non blue badge holders on Burgate. Some people regularly rat-run through the Burgate pedestrian zone. On safety it is clear that are risks to pedestrians from cyclists. However, when we look at the bigger picture and analyse accident statistics we see that the benefits of cycling far outweigh the risks. The benefits are for the non cyclists as well and include less tax spent on the NHS, less pollution, less congestion, less danger. As you know this is already reflected KCC and Canterbury City Council Policy documents. I accept that there may need to be some restriction at the times of day when there are a lot of pedestrians, particularly the on the High Street. A blanket ban on cycling however is over the top and discourages people from choosing a bicycle over a car for daily transport. Please can you ask for a review on the placement of these signs.